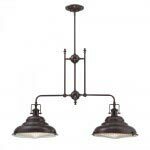 Posted November 21, 2013 by Norburn Lighting and Bath Centre & filed under Kitchen Lighting . 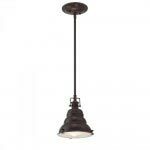 It is a common misconception that all industrial style lighting was all cold, hard edges and worn materials. 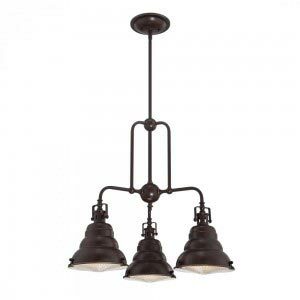 The latest industrial offerings from Quoizel challenge that with mainstream appeal in both modern and traditional homes. 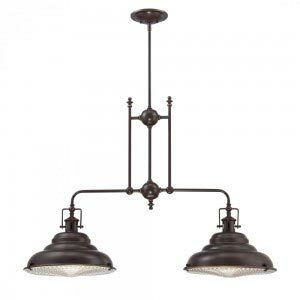 The Eastvale Collection from Quoizel lets you create your own personal industrial wow factor. The Eastvalle range shows particular designer flair when placed over a kitchen island bench or dining table. Set within an environment of contemporary white or traditional timber, the look is completed with your favourite pops of colour. 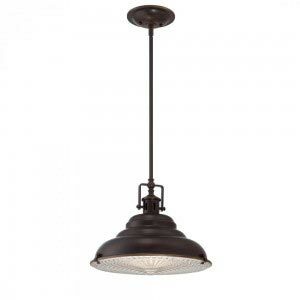 And remember, don’t be a slave to one particular trend. Mixing looks such as Industrial with vintage glamour or classic Scandinavian expresses your individuality and personal style.